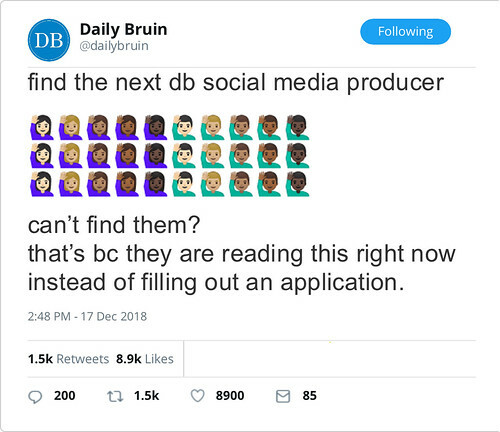 The Daily Bruin Social Media department serves as a link between the Daily Bruin's audience and newsroom. In the age of digital journalism, social media is integral to disseminating news and maintaining readership. Social Media producers will work across various social media platforms, including Facebook, Twitter, Instagram and Reddit to help our audience discover and engage with our content. Producers work closely with all of the Bruin's editorial departments to best market each section's content online and set a coverage agenda that aims to communicate news and inform the UCLA community. Past Applications Winter 2019 Closed Deadline: Jan. 11, 2019, 11:59 p.m. Fall 2017 Closed Deadline: Oct. 13, 2017, 11:59 p.m. Fall 2016 Closed Deadline: Sept. 30, 2016, 11:59 p.m.